You all know that I have scalp psoriasis and at times, I do suffer from flare ups on my body. Little did I know that this genetic disorder can also affect my nails. Yes! My nails. This is the reason you would barely see me post nail polish swatches on this blog. Well, unless you would like to see my toe nails di ba? I have a gritty dotted nails. (Yes, my dotted engravings ang nails ko which may not be really noticeable at first glance). This led me to stay away from nail polishes which I know contain harsh chemicals and prolonged use can damage the nails. I do love applying polish on my toe nails. I rarely leave it bare for a week. The end result? My toe nails became brittle and looked severely yellow and damage. So when I got an invite to the launch of Galderma's newest nail product, Loxycare, I did not hesitate at all. My initial thought was -- this product was a gel nail polish. Oh boy I was wrong! hehe I was really hopeful that this could lessen the brittleness of my nails and prevent them from cracking every now and then. 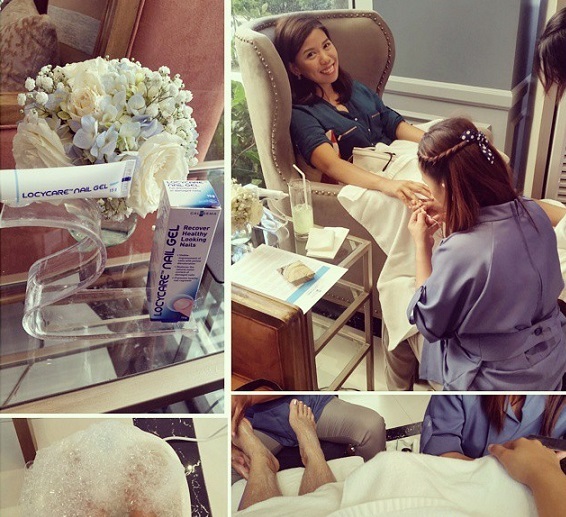 Galderma and Castro PR treated us to a very relaxing afternoon at the Maison by Nail Spa at Rockwell for the launch of Loxycare. Loxycare is indeed a breakthrough product in nail care as it promises to make nails look healthier. It also promises to improve discolored and brittle nails after two weeks of continued use. Loxycare is best for visibly yellow/discolored nails, dry/parched nails, and fragile nails. Locycare Nail Gel penetrates the nails for optimal hydrationand restores the water content of damaged nails. It helps promotes healthy nail re-growth andbrings back the natural, clean, and healthy look of your nails just after two (2) weeks of daily application. Proven to recover healthy nails, Locycare contains humectants and Artemisia leaf extract to hydrate and improve dry, damaged, and discolored nails. Just dab it on your nails, lightly massage it into your nail plates, and it will effortlessly penetrate the nails keeping them moisturized, in check, and healthy after each application.Locycare is here to revolutionize nail care amongst nail polish enthusiasts, consumers and beauty consultants. You too can achieve perfect, bare, happy, and healthy nails with Locycare! How to apply this Loxycare Gel? Spread the product on the nail frame and spread it over the nails. Wait for a few minutes and let the nails absorb the gel for better result.